Getting stronger, fitter, and healthier by sticking to the basics. It's not rocket science, it's doing the simple stuff the right way. Strength-Basics updates every Monday, plus extra posts during the week. Every year, I set up a series of annual training goals. Four is few enough that I have to make decisions about priorities. For example: Do I want to get a stronger deadlift, or do I want to lean out? Four is enough that I don't chop off actual goals or start doubling up. For example: Get a stronger deadlift while I lean out. Sure, two nice goals, but I don't want to pretend they are one. I write these goals down and I hand them to my trainer. Handwritten, dated, and signed. What he does with them, I don't know. I keep a copy of them pinned to my cork board behind my work desk in my home "office," where I do most of my writing and much of my research and studying. Handing them in makes me accountable to someone else for my success. This probably sounds totally hypocritical, since I'm all about clients setting process goals for themselves. What I have found is that I tend to naturally set my own process goals. - I will do my posture drills every day. - I will stretch every day. - I will get in 2-3 full workouts and 1-2 small accessory workouts per week without fail. I've missed zero training sessions, not counting planned misses. So for training, setting process goals is just a matter of writing down how I'll do things, not getting myself on the path to doing them. I do need outcome goals, though. I need to know where I'm going. So does my coach. There is this great Precision Nutrition article that says, "Elite coaches know that the outcome is their responsibility and that the behavior is the responsibility of the client." I take care of the doing, and I set the outcome goals so my coach and I both know where I aim to get. They're always actionable, or at least, they eliminate training or workouts or methods that run contrary to them. If I put "increase shoulder stability" on my outcome goals, I know that skipping my shoulder warmups or programming in too little shoulder stabilization is not a good choice. If I put in "Add 10 pounds to my max deadlift" then I know I need to keep in glute exercises and low back exercises and a myriad of little hip exercises. My goals can be really specific ("add 10 pounds to my deadlift.") They can be broad, but have a clear outcome ("Get on the record board and stay there.") They can be vague and hard to measure, but clear to me, personally ("Feel bulletproof.") They have to be goals I can know when I've gotten them. Pulling a weight 10 pounds heavier, walking into the gym and looking up and seeing "Peter Dell'Orto" on the record board, or walking into a gym and grappling with all comers for a whole class without a mental twinge of "Can I handle that guy? Will my body take this much effort?" All of those, I know when I've gotten there. The more vague, feeling-based ones are tougher on my coach. So I try to keep at least some of them more concrete. This is the time of year when I make these goals, because this was the time of year when I first starting doing it some years back. So goals are on my mind. I'll know mine by a week from yesterday. How about you? Where are you going this year? My name is Peter V. Dell'Orto. I am a professional personal trainer. I am a Certified Personal Trainer from the NSCA. I am also a Precision Nutrition Level 1 Certified nutrition coach. I am also an athlete myself - I formerly fought amateur MMA and submission wrestling, and I train twice a week in MMA. I also train under a strength coach - Mike Guadango at Freak Strength. I am skilled at training others, but I thrive best when I have a knowledgeable coach to direct my own training. 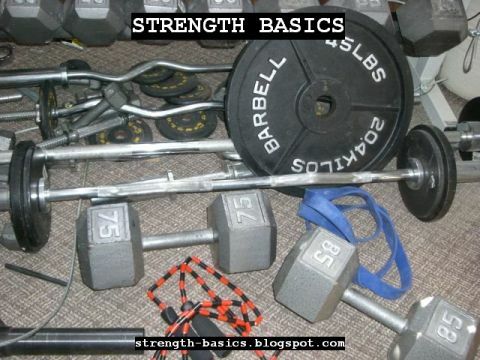 This blog is a collection of various advice and information about basic strength training. I'm interested in strength and conditioning. The "frequently asked questions" in this area are VERY frequently asked. This is my attempt to pull together the stuff I keep saying over and over. It's also a place for to put links related to strength and conditioning, and to muse on strength training in general. Further, writing this blog tests what I know. You never really know something until you can demonstrate an ability to explain it to someone else. As I write, I learn what I know and I don't know. In the process, I hope to pass on knowledge to you. I hope this material is useful to you. Please consider it a springboard to future study. Although I endeavor to be complete and accurate, this is not meant to be the final answer to any subject addressed within the blog. Strength Basics may teach you something, but more than that I hope it makes you curious to learn more! Always remember to check with your doctor before you begin any kind of strength or exercise program. I'm a professional personal trainer, but I'm not your personal trainer. Use this information at your own risk and with the understanding that not all exercise advice is appropriate for all trainees. Blog - Official Website of Joe DeFranco & DeFranco’s Gym! Joe Provides Valuable Answers to Stupid Questions! Do You ALWAYS Train Plugged In? Create the perfect meal with this simple 5-step guide. [Infographic] Hundreds of healthy meal combinations made easy. Lose 40 Pounds in 40 Days?!?! Dynamic Dan: How Did He Learn How To Handstand Consistently?